In association with its well-known ABET-accredited engineering degree program, Sweet Briar College is launching a new computer science major beginning in fall 2017, pending approval by the Southern Association of Colleges and Schools Commission on Colleges. The new program will add to Sweet Briar’s more than 40 areas of study. Students experiment with Arduino programming in a computer lab in Guion Science Center. Since January, Sweet Briar has worked with Harvey Mudd and Silicon Valley companies to develop a focused curriculum that will provide Sweet Briar graduates with a competitive edge in the workplace. Computer science majors will take two semesters of Python, one semester of Java and one semester using C/C++ and Linux. According to the National Center for Women and Information Technology (NCWIT), women made up only 25 percent of the professional computing workforce in 2015. Building a program that is attractive to women from the first class has been a priority, says Steve Wassell, director of the new computer science program. Electives include the use of Swift, the new and upcoming language developed at Apple, as well as R.
Upper-level electives at Sweet Briar include computer security, computer vision and data science. 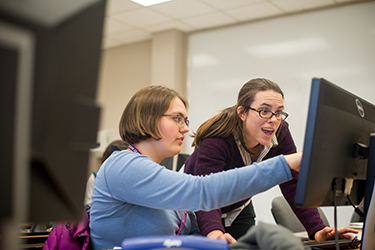 Engineering professor Kaelyn Leake (right) helps a student write code. First-year courses for computer science majors include engineering design, which features some Arduino programming and a team-based approach to problem solving, as well as calculus and statistics. Majors will complete a two-semester capstone project in their senior year. Sweet Briar and Google are exploring how the company can provide partnerships and mentorships to students. 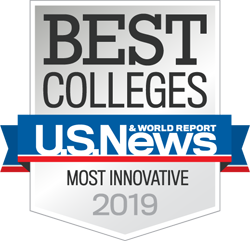 Plans include opportunities for programmers to spend significant time on campus to provide instruction in areas such as mobile application development. In spring 2018, Sidnie Davis, Google’s tech student outreach and university programs specialist, will visit Sweet Briar to talk to students and faculty about the field and Google’s groundbreaking work. 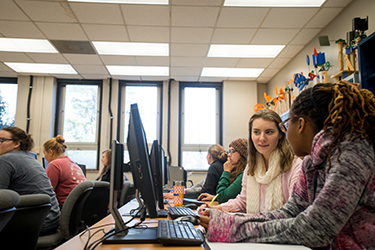 Although the computer science major requires 47 credits, students will have the opportunity to take a broad array of liberal arts courses, the hallmark of a Sweet Briar College education, Wassell says. “Employers need skilled programmers who can also write well, communicate their ideas coherently, and think about the larger issues for their company and society,” he says.